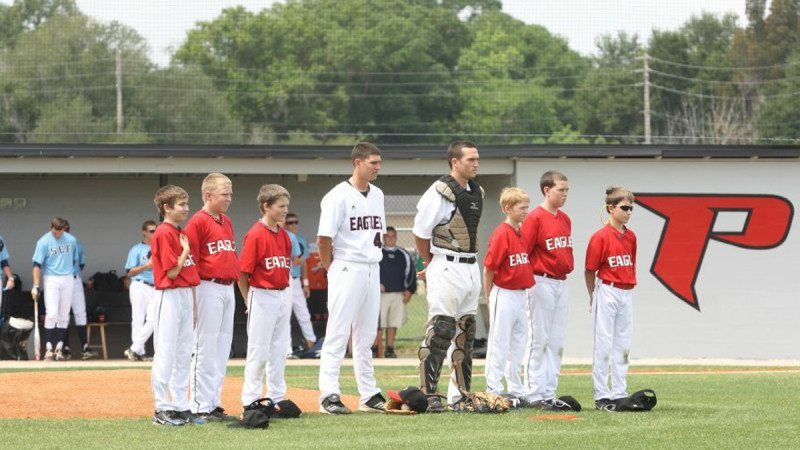 On Saturday the Polk State baseball diamond in Winter Haven was the site of “Fan Appreciation Day,” as well as a special visit by the “junior” Eagles of South Lakeland. Polk’s Eagles earned a key 2-1 win over Suncoast Conference rival, State College of Florida, behind 8 2/3 strong innings from pitcher, Brian Johnson. In addition to the in-game highlights, however, the event featured some special pre-game moments, as the youth team sporting Polk State colors and logos joined “the big boys” for a pre-game workout, pep talks from Polk State coaches and some time in the dugout. In addition, the “junior” Eagles took the field with their Polk State counterparts for the national anthem.